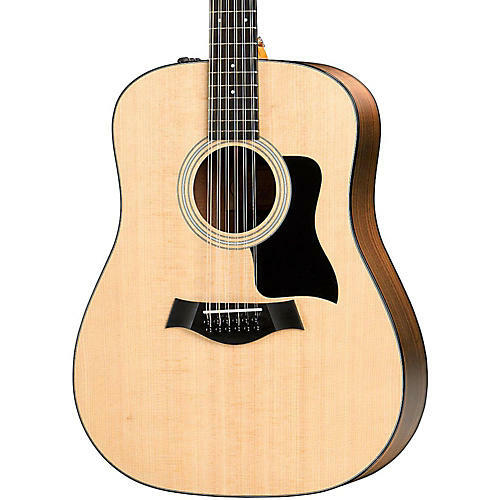 Taylor's entry-level 12-string with their highly regarded ES2 electronics at very accessible price. Taylor's 100 Series makes a great guitar-playing experience accessible to everyone with these real wood instruments. These models have layered walnut backs and sides, as well as new architecture for even more volume and dynamics. For people taking the first or next step in their musical journey, these instruments promise to accelerate players' growth and enhance their enjoyment. Taylor's famous neck profile makes it easy for developing players to form barre chords. All 100 Series models include a durable, 600-denier nylon gig bag with double-stitched seams and reinforced stress points. The Dreadnought is one of the most traditional acoustic guitar shapes. Taylor's version has been refined to blend its trademark robust low-end tone with a snappy midrange and brilliant treble notes, producing a pleasing balance of power and articulation. If you're a flatpicker or strummer who likes to dig in on lead or rhythm, the Dreadnought should serve you well.